Been waiting since Tuesday. No further comments? Sorry I'm late to the party. It seems that I don't always get email notifications on this thread when someone posts. @jrock I got your PM though. It looks like map, graphs, and dashboard windows are missing. Try going under the Window menu and selecting Reset Window Positions. This will bring all the windows to their default positions. It could be that you moved from a dual monitor config to a single monitor config and the windows got confused. Everything seems to be working other than the GPS tracks vary considerably from where the vehicle actually went. It showed the vehicle driving across residential blocks, through houses etc. Could simply be the Viofo GPS deviating. Will have to get more familiar with the camera and DV software. Otherwise, it's a nice program. Hi @jrock first let me say I LOVE your software! Unfortunately, I can’t seem to get it to work with my GPS info from my Rexing V1P dash camera. It displays video info, but the map does not update with GPS info. Any ideas on how to make this work? Happy to send you a clip or two. Hi @jrock Any ideas on how to make this work? Happy to send you a clip or two. Not sure I understand why you posted the link. I've reviewed the dashcamview faq's. Is there something I'm missing here that would help? #1 explains where to send sample clips. Ok. Thanks. I'll email John a clip or two. @Barrybados, you just need to widen the Map window a bit and the controls will suddenly appear. Shrink the window and the controls will disappear. This is mentioned in the Users Manual but it's not obvious. The next release will have instruction in the Map title bar to "expand the window for controls". @rickzski, thanks for the Rexing V1P samples. I've decoded their GPS information successfully. The next release (v3.0.4) will add compatibility for this 2-channel dashcam model. BTW, Dashcam Viewer v3.0.3 is already compatible with the 2-channel Rexing V1LG. 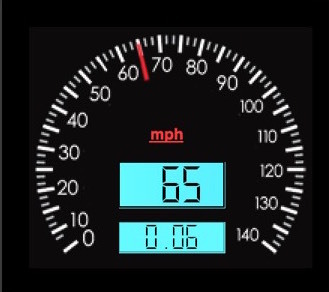 The speedometer has been enhanced with better graphics and user-configurable maximum speed. Double-click the speedometer face to edit max speed, or single-click to change speed units. Extended fuzzy logic B movie search beyond the SG9663DC to include Rexing V1LG, Rexing V1P, Transcend DP520. This improves A/B movie matching for these dual-channel dashcams. Improvements to window positions and window sizes when the program is first run. Fixed bug in which compass could point in wrong direction if speed units changed. Is it possible to cut video in this program without loss of quality, if not, is such a function expected? @gse Yes, when you export a single-channel clip at 1x speed, no transcoding is performed. For dual-channel or non-normal playback rates, transcoding must be performed so there will be a slight degradation in quality. I recommend replacing the LGPL version of ffmpeg with the GPL version if you do transcoded clips since it has better encoders. This is mentioned in the Dashcam Viewer Users Manual. Added support for a second variant INNOVV K2 movie file-naming convention. Added support for Transcend DrivePro230. I can't find a way to play back videos in full screen mode. (I only see zoom options) This makes it tough to watch videos while on a smaller screen laptop on the go etc. (when you don't want any of the other boxes on the screen and just care about the video only) If it's not an option, is this something that can be added? ALT-Enter is the most common key combo in Windows to go full screen. It would be nice to still be able to flip between Front and Rear videos with the R key even while still full screen as well. Good suggestion. I will look into it.